Regulars in The Phoenix; The Etherington Brothers have been making all-ages comic adventures for over a decade, and are the creators of Long Gone Don, Monkey Nuts, Freaky and Fearless, Baggage and Von Doogan. Lorenzo has also released 2 (soon to be 3) Deluxe Collection Sketchbooks, the fantastic The Art Of Stranski and - the currently KickStarting - How To Think When You Draw Volume 1. As well as all that awesome, they have created comics, stories and art for Star Wars, Transformers, How to Train Your Dragon, The Dandy, Kung Fu Panda, Wallace & Gromit, Madagascar and James Bond. Their client list includes Disney, Dreamworks, Aardman, the BBC, and many of the world's largest book publishers. The ACP is a weekly comics podcast hosted by Vince Hunt (creator of The Red Mask From Mars), Dan Butcher (creator of Vanguard) and Tony Esmond (writer for Down The Tubes). As well as bringing you a weekly dose of comics chat (including interviews with comic creators and beyond), they've also launched their own Awesome Anthology Comic. Little Heroes will be back to the event that started their con journey off. 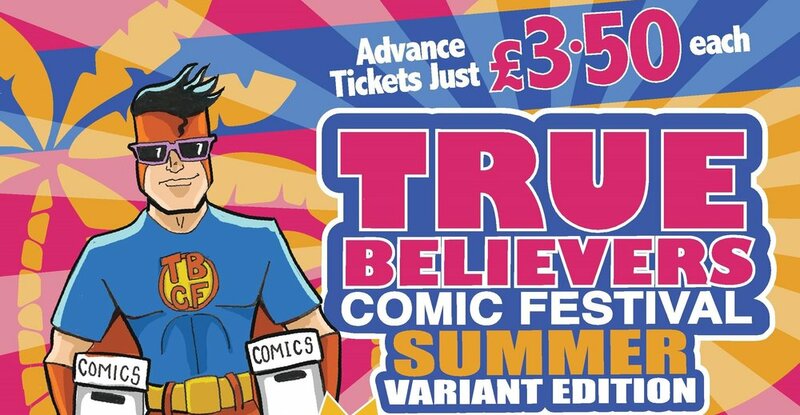 At the last True believers in February they released their first charity anthology and - in keeping with tradition - they will be releasing their second, alongside giving out free comic making kits to children. Graphic designer, video editor, and part time comic creator. I'll be selling copies of the acclaimed 'Midnight Man' books, including the brand new sequel 'Gunspace'. I'll also have my popular 'Andy-Thology' collection which collects stories written by Kieron Gillen, John Reppion & Leah Moore and Mo Ali as well as pinups done for various other books. The original 'Wolfmen' books make a return appearance along with original art and prints. As previously we will have our 'Moon ' series of comics, associated artwork :we also now have mugs and two t-shirt deigns based on Moon. Our range of artwork is also being expanded to offer alternatives to our 'fans. C L Raven are identical twins and mistresses of the macabre from Cardiff. They’re horror writers, as ‘bringers of nightmares’ isn’t a recognised job title. They spend their time looking after their animal army and drinking more Red Bull than the recommended government guidelines. They write short stories, novels, comics and articles and have been published in various anthologies and horror magazines. Several short stories and novels have also been long and shortlisted in various competitions. Last year, they won third prize in the British Fantasy Society Award. They were published in the Mammoth Book of Jack the Ripper, which makes their fascination with him seem less creepy. They’ve been working on indie horror film, Clownface and will soon be writing and directing their first short horror film, The Black Kiss. Every Friday night, they host The Graveyard Shift on Vitalize Radio. Along with their friend Neen, they prowl the country hunting for ghosts for their YouTube show, Calamityville Horror and can also be found urb exing in places they shouldn’t be. They also gracefully fall off poles as they learn PoleFit, and ungracefully faceplant as they learn gymnastics. 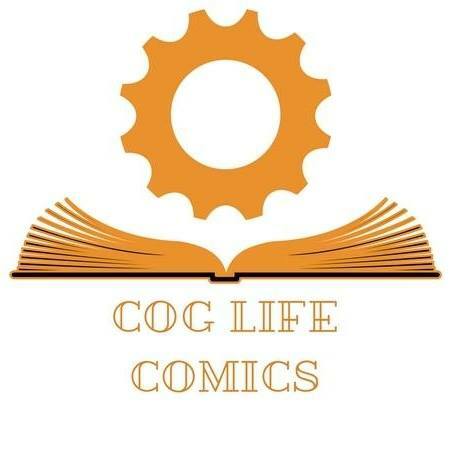 Cog Life Comics is truly at home telling the weird and the wonderful, the bizarre and the real, and the past, present and future. So if you want to experience the heart-wrenching, minding-bending fantasia that only the best UK independent comic books have to offer, then you are home! Eight years ago Deadstar Publishing was launched with the intention of showcasing new talent by publishing books, comics and graphic novels with a focus on horror, science fiction and fantasy. We wanted to help creators get noticed and started with Rising Stars volume 1 – alumni from which have gone on to make comics their full time career. Our current flagship titles are Dexter’s Half Dozen and our family friendly Dolphin Squad graphic novels. 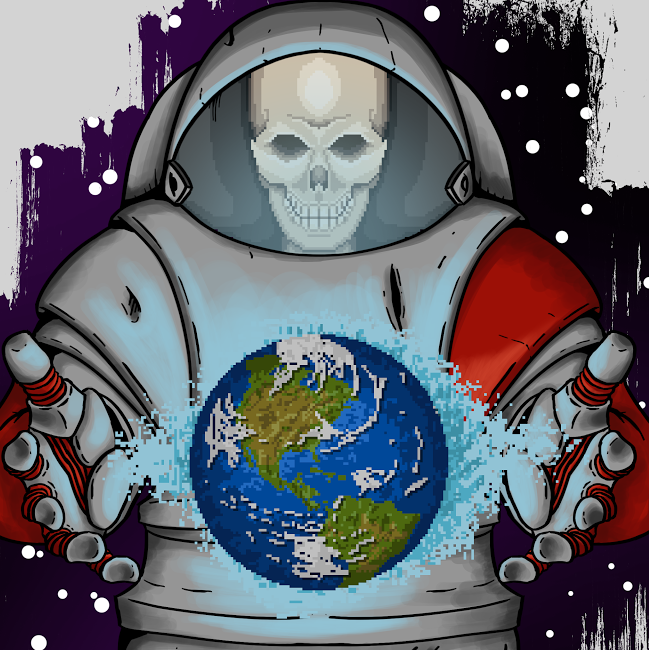 Horde Comics are a UK small press comic producer. With our 1st book launching imminently. We'll be selling copies of the book. Prints and other ancillary materials (As well as potentially some commission sketches from our artist Gregg Mason). Depending on progress on our other releases we may also have some materials from these too. Creators of The Inheretic graphic novel and Lollipop & Ten, a steampunk fantasy. Pipedream Comics helps you to discover the world of indie and small press comics online. We are also the publishers of indie comics fanzine The Pull List and will have a new issue available on the day. I'm a Portsmouth-based artist and writer currently self-publishing Gateway City (sci-fi noir) and doing art on Cult Empire's new title, Lady Hollywood. Various other projects to boot (Mad Robot, AccentUK). Hi! I'm a writer, artist and maker from Cardiff, Wales who is currently producing NPC Tea, a comic about a tea shop in Cardiff (fancy that!) run by orcs, elves and other fantasy creatures. I'm also known for Heart of Time (a comic about time travel, pugs, Cardiff...woah, there's that city again) and have worked in the games industry (Master Reboot, Soul Axiom - which, sidenote, both had characters from Cardiff. What are the chances). I like to create goofy DnD characters and annoy the hell out of Ana Catris and Sian Jefferson. Let's hang out! 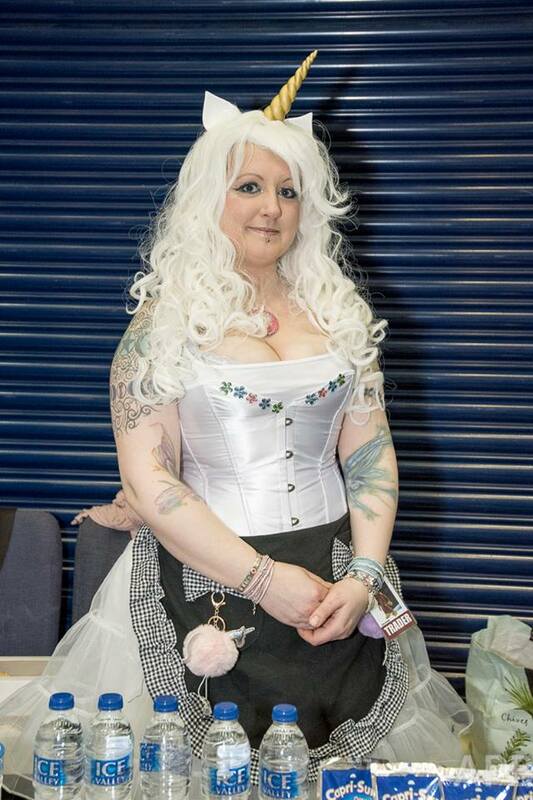 Siân started creating comics in 2012 with her first series, The Book Of Fey which launched as a web-comic. Between 2013 and 2015 she released her mini comic series The Adventures of Soosh before releasing her second book Soosh! in 2017.Siân is also the creator of Fear-Less, a diary comic, which launched mid 2017. She is currently working on her next graphic novel, Overlord, due for release in 2018. Susie Gander took her battle with Hodgkin’s Lymphoma and turned it into the amazing charity comic Perrywinkle. She has also provided stories for the charity anthology comics Little Heroes #1 (with Tony Esmond) and Tales From Beyond Infinity #1. 20% of the profits from Perrywinkle are donated to the Bloodwise Charity. 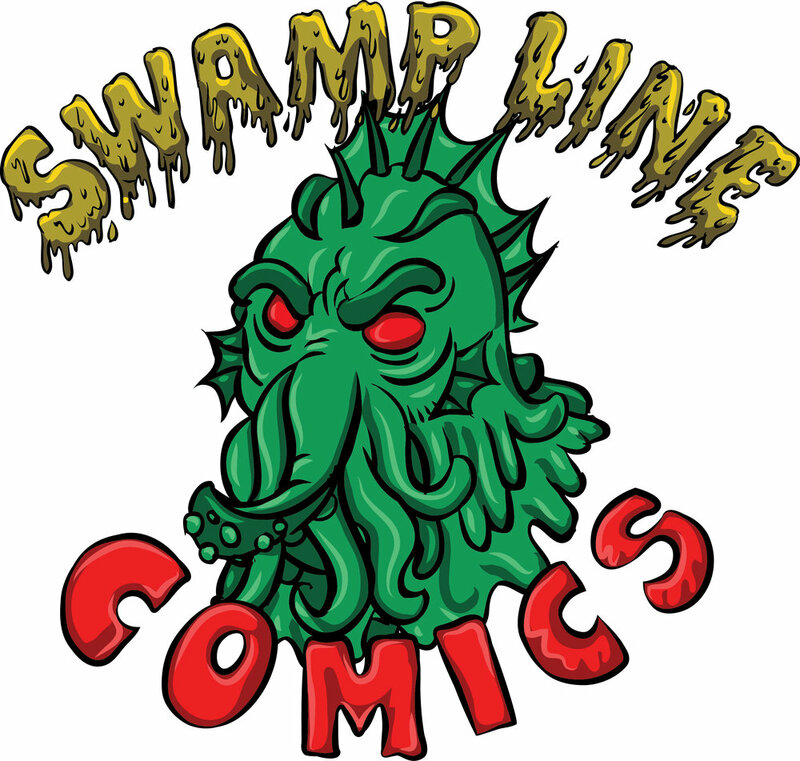 Swampline Comics was co-founded by comic creators Kim Roberts and Chris Allen. They create and publish a collection of comics spanning various genres. Time Bomb Comics is a British comics company that publishes one-shots, graphic novels and the ongoing “Flintlock” anthology adventure series. Based in Birmingham, England, Time Bomb Comics was created in September 2007 with one simple ambition: To tell great stories in the comics medium. Comics released under the Time Bomb Comics banner are diverse in theme, genre and format, and come with only one limitation - the imagination of their creative teams. Tinynoggin specialises in pop culture zines and drawings - French Yé-yé, Morrissey and Nicolas Cage all make appearances in her work. Wanna learn French or all about the films of Nic Cage? 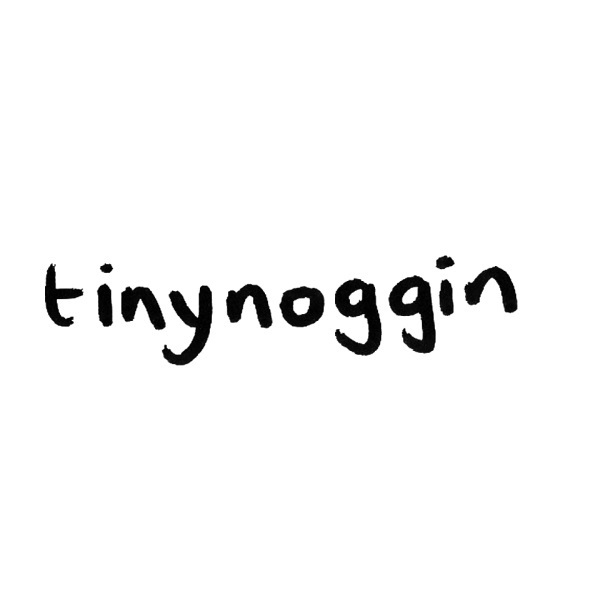 Come along and check out Tinynoggin Comics! The WigglyPet Press produces books, zines, comic strips, colouring books... among many and varied other things that perhaps should not exist in this universe. Sleepy Animator/Illustrator based in Cheltenham. Specialising in character design, fan art, illustration and motion graphics. Hello! I am a studying Illustrator whose work is predominantly digital! I love storytelling, my works most often of my own characters and narratives, and while I'm studying I hope to build them into their own comics and see those narratives come alive. I will be here with prints and badges so feel free to say hello and see the work I am making! I am an illustrator and pixel artist who's work celebrates all areas of geekdom. Mild mannered graphic designers by day, crime fighting super stationery creators by night. Heroes for Hire present a super selection of collectible hero inspired business cards, paying homage to the alter egos of your favourite superheroes, for just a few of your earth credits you too can be Tony Stark, Matt Murdock or Bruce Banner. We are Hikimori Crafts ~ Three young artists who dabble in the (dark) arts. We sell a wide range of all things geeky, including prints, badges, stickers and original art pieces, so stop by if you like video games, TV shows, movies, anime or simply enjoy art! Digital artist and illustrator in progress - and resident True Believers graphic designer and artist - Andy Hanks (aka I Am Zoot) will be at True Believers (or at least his stand in will, whilst Andy is busy Agenting on the day), with a selection of prints, canvases and more. I am a freelance artist making a start in the world of art. I mostly work digitally and I am available for commissions! please contact me via my website or come chat to me on the day! I'm a freelance illustrator and comic writer. I will be selling art prints, keychains and badges as well as promoting an upcoming comic. I’m a digital and traditional artist who loves a variety of art styles! I draw dragons, fantasy characters as well as game character fanart. I sell mostly art prints but have some other little things available too! Come say hi! We sell hand drawn artwork and prints and memorabilia. I'm a freelance illustrator and concept artist, I specialise mostly on fantasy illustrations that have a mixture of western old master painters and a dash of east asian/manga influence. I'll be selling mostly prints of my artwork with some vinyl stickers and hopefully my first volume of my sketchbook. Twisted Art specialises in custom fan art and original art, with a variety of geeky goodies available. These range from magnets, postcards, sketch cards and prints to custom commission requests. There's something to suit everyone! I will be selling mostly back issues of Marvel,DC and Independent comic titles ,alongside Dr Who related items. I am a unicorn cosplaying cupcake and sweet vendor. Proud Lion was founded by Ben Fardon (Managing Director) in 2008. Ben has been a comic collector since he was young, with his early interests including Iron Man, Transformers, Batman: Knightfall and Claremont & Lee's X-Men. After working in comic book retail for several years, he decided it was time to open his own shop in the heart of Cheltenham. Proud Lion celebrated its grand opening on Free Comic Book Day in 2008, and has been a hub for fans of both mainstream and indie comics ever since. In recent years, Proud Lion has grown to become a family business, with Ben's partner Rae Hurley coming on board to expand gaming in the shop. She fell in love with board games with the discovery of Small World, and has been an avid gamer ever since. Now she regularly runs demo days, open play nights, RPG sessions, and tournaments to encourage other gamers to share her obsession. 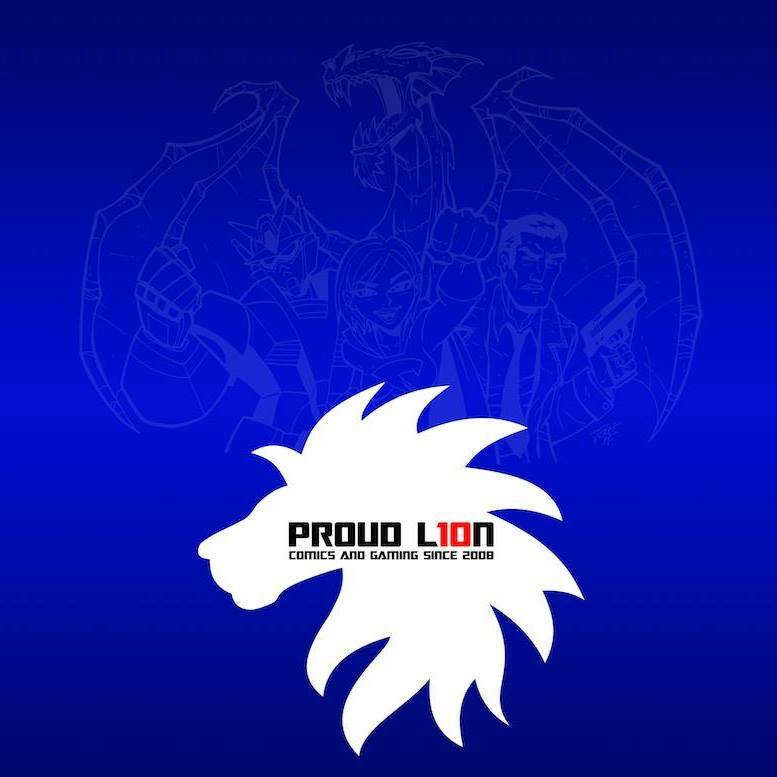 In 2017, Proud Lion split into two stores - a comic shop and a friendly local gaming centre. 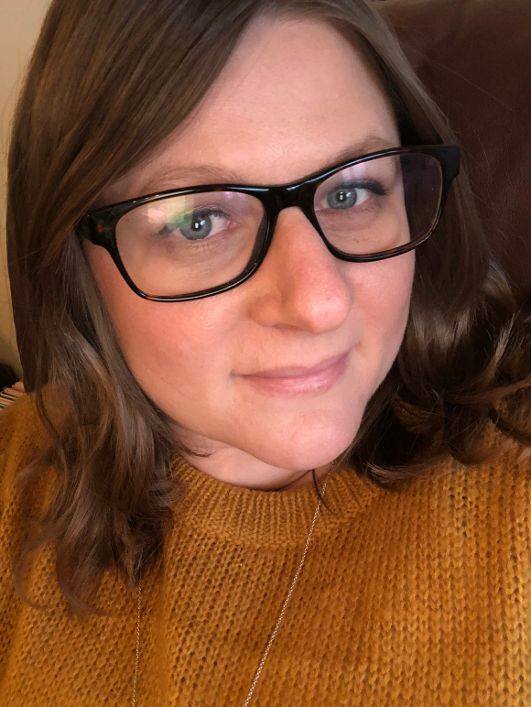 Ben has continued to manage the comic shop, with Rae stepping into the new role as manager and host at the FLGC. 2018 marks 10 years of Proud Lion and we're celebrating throughout the year! Rob started buying comics when he was 8 years old. The first comics that really interested him were the Jim Starlin “Captain Marvel” issues and after collecting comics for over ten years Rob decided to start a business to sell them as well, which led to the creation of RNG Comics. He has been trading comics for around 30 years. Starting with UKCAC in the late eighties and early nineties, RNG regularly sells at Golden Orbit comic marts around the country and has visited many other large marts such as Bristol Comic Expo, and NICE. We are two brothers who sell pop culture items such as Comic books and action figures. * Tables listed as taking card payments may be subject to wi-fi signal on the day. A minimum spend for card payments may apply at some tables.